Tufi is a small town located in a remote, pristine region of Papua New Guinea at the tip of Cape Nelson in Oro Province. Tufi has been described as the “Scandinavia of the tropics”. The breath-taking “fjords” were not carved out by icy glaciers, but created by the ancient eruption of 3 volcanoes, plunging over 90 metres deep and rising over 150 metres vertically above the water. The scenery is simply spectacular! The area is also known for its production of tapa cloth, made from the bark of the paper mulberry tree and skillfully decorated. Tufi is only accessible by air or sea. The flight time from Port Moresby to Tufi is approximately 55 minutes. Domestic flights and local charter flights are available. Tufi is located on a coastal strip between the Solomon Sea and the Owen Stanley Range in Oro Province on the north-east side of the mainland of Papua New Guinea, approximately 250 kilometres east north-east of the capital, Port Moresby. Situated between Lae and Alotau on the tip of Cape Nelson, Tufi is 130 kilometres east of Kokoda and 120 kilometres east south-east of Popondetta, the capital of Oro Province. The flight from Port Moresby to Tufi features a spectacular crossing of the Owen Stanley Ranges (the mountains of the Kokoda Track), then flies along the coast over palm oil plantations, forest and mountains, then finally reaches the fjords rising majestically out of the Solomon Sea. Tufi is an un-spoilt, adventurer’s paradise. Apart from the impressive diving and snorkeling, the pristine waters surrounding Tufi are also ideal for game fishing, bottom fishing and estuarine fishing. Dogtooth tuna, yellowfin tuna, wahoo, trevally, Spanish mackerel, giant barracuda are all in abundance in this scattered network of reefs of over 250 square miles. Enjoy bottom fishing for red emperor and nannygai or fish in the estuaries for the mighty black bass and mangrove jack. Take a traditional outrigger safari expedition to explore the coastline from 1 to 7 days or sea kayak down the coast through the fjords over large coral outcrops and shelves to sandy cays, into deep fjords to take in the surrounding rainforests. Trek for 3 to 5 days to the twin peaks of Mt. Trafalgar and Mt. Britannia in virgin rainforest. Nature enthusiasts will love Tufi with it’s wide range of diverse habitats each with their own unique flora and fauna, most noticeably an abundant range or orchids and butterflies including the Queen Alexandra Birdwing, the largest butterfly in the world. Tufi is also a bird watcher’s paradise. Over 120 bird species are located within a few hours walk of the area including the Birds of Paradise, flocks of Horn Bills, Eclectic Parrots, rare Black Palm Cockatoos and numerous species of Lorikeets which flourish in the treetops and fjord cliff tops. Experience the local traditions and cultures by staying in a village eco-guest house. Tufi has a tropical rainforest climate. The average daily temperature ranges between 22ºC to 31ºC. Tufi has high precipitation with 7 of the 12 months receiving over 200mm of rain. Diving is conducted year round at Tufi. Conditions will vary slightly throughout the year. Water temperature averages between 27ºC to 29ºC all year and visibility often exceeds 30 metres. October and November is the doldrum period when conditions both offshore and onshore are at their optimum. The water is calmer, clearer and slightly cooler during this period bringing out the critters. May to September is the dry, south-west monsoon period when there is also good visibility. However, the wind can be stronger sometimes limiting access the offshore reefs. December to March is the wet north-west monsoon bringing calmer seas and warmer water but visibility can be affected by river run-off. Tufi offers amazing marine diversity and a variety of diving experiences including fjord, reef and wreck diving. The shallow water near the wharf has some incredible critter subjects, allowing for great photo shoots. The calm, clear and protected waters of the fjords offer excellent diving and snorkelling conditions. The amazing variety of life includes gobies, nudibranch, mandarin fish, ghost pipe fish, pigmy seahorses, shrimps, clams, and many other fascinating critters. Pelagics such as dog fin tuna, turtles and manta rays are also reported sightings. The lack of current movement in the fjords has produced spectacular coral growth. The sloping wall is covered with sponges and shelf coral species grow prolifically. A 20-50 minute boat ride brings you to a string of reefs with bommies coming up from a depth of 50 to 600m, to a safe diving level of 7m. Visibility exceeds 30m with average year-round water temperatures of 26°C to 30°C. The abundance of marine life includes reef fish, barracuda, Spanish mackerel tuna, white tip and black tip reef sharks and the rare white hammerhead. Mantas, eagle rays and turtles are also often seen. Where our dive shop complex is today was a US base for P.T boats during WWII. Here you can dive in and around the remains of 2 PT boats, sunk during an air raid in 1942. There are still 2 live torpedoes down there completely intact. A couple of anti-aircraft machine guns and lots of ammo are scattered around and about. One of the highlights of this dive is a perfectly good ol' Landrover….. The secret of how it got to be 'parked' there so neatly will be revealed after you completed this dive! This is a decompression dive with Max depth 45m. Deco stops are compulsory and surface interval of 4 hours is mandatory before the second dive. Wall diving at its best! From 7m, vertical walls plummet down to beyond 40 m where it slopes down way beyond your vision. The walls are covered in colourful lichens, hard and soft corals. Nudibranchs of all sizes and varieties dot these walls. There is something here for every diver and under water photographer. Undoubtedly one of Tufi's best dive sites! The dive team swims towards the far point where the reef drops off to beyond 200 m. Generally the current is strong, bringing plankton and bountiful food for thousands of fishes. The place literally 'explodes'. Hammerheads, reef sharks, rays and schools of pelagic frantically are in search of food. You can 'hang on' a protruding rock or a submerged mooring rope and watch the show. Mulloway is named after one of the first guests who lives in Mulloway near Coffs Harbour in Australia. Great visibility caused by the ocean's current upwelling. A spectacular giant clam lives at the safety stop. 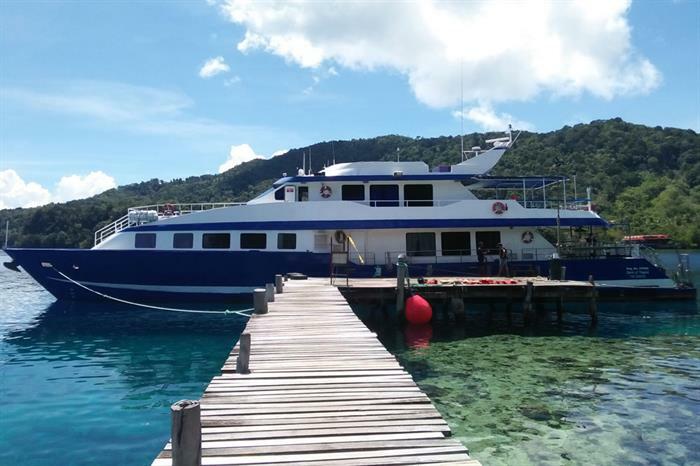 Minor's reef is one of Tufi's most spectacular dive sites. The perpendicular walls are covered with large minor nudibranchs. Their yellow 'rose' shaped eggs are superb subjects for photography. Often tiny clear, see-through shrimps hide amongst the egg formation. These shrimps are difficult to spot at first, but great for macro shots. Our giant manta is often seen cruising around this reef continuously soaking up the plankton. At times a large school of big 'hump headed' parrot fish are seen cruising past. Close to Mulloway, this extensive reef is ideal for drift-diving the slope with the current, after diving the wall into the current. There are plenty of pelagics to be seen here. The white hammerhead can be seen here as well. The B17 Bomber "Blackjack" wreckage site is one of the world's greatest aircraft wreck dives. The historic B17 lies in near-perfect condition in 46 metres of water. Nearby is the village of Boga Boga, where tour participants are afforded the opportunity to marvel at its beautiful golden beaches and meet the village elders, who still tell stories of how they rescued the crew from the sinking plane. Blackjack can be dived from Tufi between the months of November to April only. A minimum of 6 divers is required and extra charges apply.